Description of "Major Railway Accidents in India, 2000-09"
The only book on this topic. It gives details of over 400 major accidents which occurred in India during the 2000s, drawing from official records as well as press reports. It gives detailed coverage to disasters such as the Rajdhani Express derailment in 2002 and the Delta Fast Passenger derailment in 2005, besides other tragic incidents such as the terror attacks on the Mumbai locals and the Samjhauta Express. Also included are peculiar incidents such as the one involving thieves poisoned by fumes from a tanker wagon in Assam in 2008 and the still-unexplained suicidal hijacking of a suburban train in Chennai in 2009. A statistical summary is also given. Ajai Banerji is an independent financial researcher with a keen interest in the Indian Railways as well as transportation safety. He holds degrees from IIT Kanpur, IIM Ahmedabad and Stanford University. He has written several articles about various aspects of the Indian Railways. 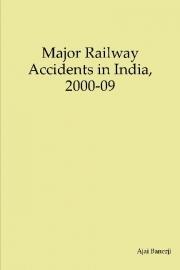 Reviews of "Major Railway Accidents in India, 2000-09"